It was that divine spirituality, we are lead to assume, that prompted the federal government to cancel energy leases in the Thompson Divide and Roan Plateau, because it is there that environmentalists need to bow down and worship the trees that produces the paper that makes the money that gives them power to elect Democrats. We expect the self-congratulatory fundraising letters will soon be spewing forth from Thompson Divide Coalition computers taking credit for killing jobs and boosting our energy prices because jobs don’t belong in the outdoors. 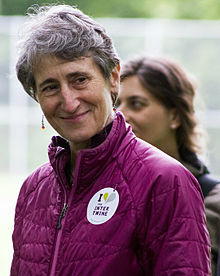 The announcement this week by Interior Secretary Sally Jewell wasn’t unexpected. She’ll be out of a job in a few weeks, so she’s making her mark as fast as she can. What we found bizarre was her declaration that putting the energy business out of business because environmentalists don’t like it, is good business sense that Trump will gleefully follow in his upcoming administration. “When you provide that kind of clarity and certainty to industry, it enables them to do their work in a way that doesn’t result in protracted disputes or lawsuits about whether they can or should develop,” Jewell said. Oh, we’re all crystal clear now. The government’s word does not matter when leases are issued and legal documents signed. If an environmentalist throws a hissy fit because it’s now trendy to oppose fracking, those agreements are broken. We’re confident as rationale, free-market thinkers that this is makes terrible business sense, and in spite of Jewell’s predictions that this is how business will be conducted in the future, Trump will disagree with her.